Enable safe and secure communications between board members, executives and more in the boardroom and beyond. Communication and collaboration are important to every industry at the board level. BoardBookit secure discussions software promotes seamless communication which directly contributes to the success of any company. 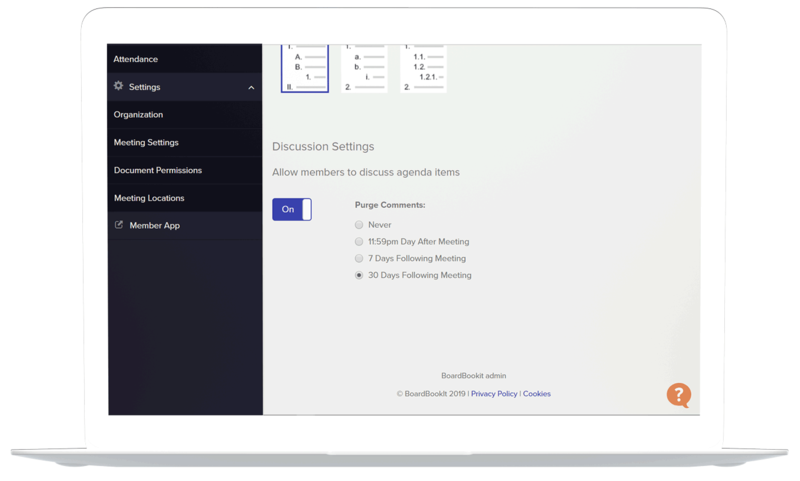 BoardBookit users can collaborate with live discussions on agenda items and documents during and in between board meetings. BoardBookit secure discussions software prepares directors and allows them to provide more valuable guidance to the organizations they serve. Good governance portals require more than providing secure documents storage but should facilitate secure collaboration. 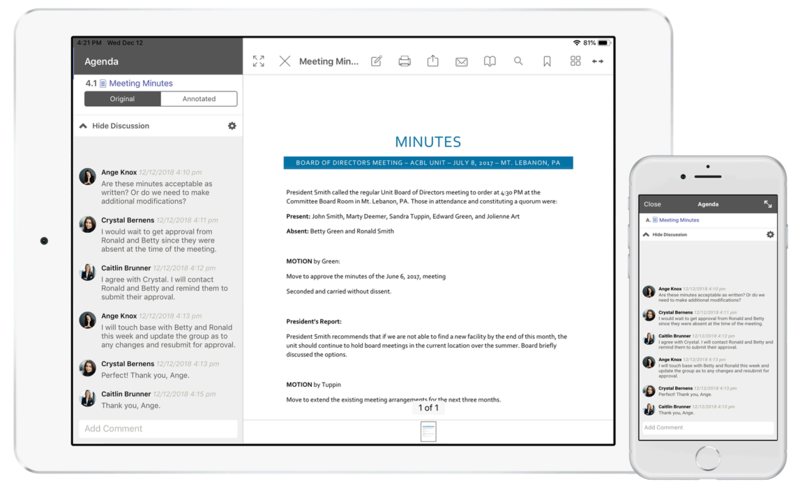 Real-time collaboration in the BoardBookit Discussions platform feature eliminates the security risks of communicating sensitive information through email. View and participate in discussions from any device inside and out of the boardroom with unparalleled ease. View, participate in, and delete collaboration sessions for effective information sharing in and out of the board room. Turn discussion functionality on and off when document collaboration is needed. Purge discussions when a collaboration session has ended or purge all discussions from BoardBookit secure discussions software platform. Administrators have the ability to delete their own comments or other user’s comments from a secure discussion in BoardBookit. All collaboration sessions in Discussions are updated in real time with no need to refresh or synchronize. Send reminders to board members to vote on board resolutions or eSign on key decisions. When administrators need to get information out to the Board and committee members fast, they can quickly post the update to the BoardBookit dashboard. Discussions updates in real-time, so board members do not need to refresh their web or mobile applications to view new comments. Eliminate the security risks of email by holding confidential conversations in the secure messaging channel. When collaboration sessions have ended, administrators can safely purge all comments. Board and committee members are always up-to-date on board business with notifications and reminders. Never forget to read, annotate, vote, or sign off on important decisions with efficiency. Board members can delete their own comments from collaboration sessions with the tap of a finger. Secure Discussions software is available on every device including web, iPad, iPhone, and Android tablets and phones so board members can collaborate anytime and anywhere. Board collaboration is made easy with our simple and intuitive interface. Easily read and contribute to document and agenda item discussions. 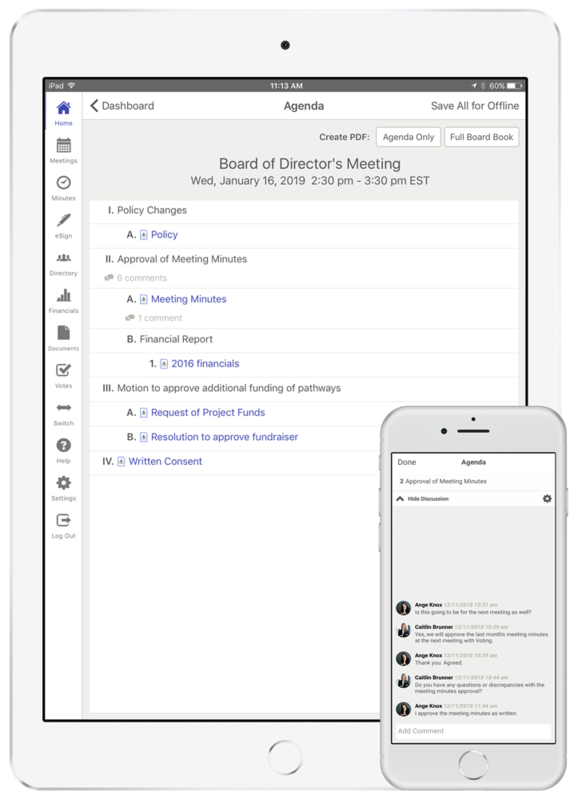 Utilize the split screen feature to view an annotated document while collaborating with other board or committee members. ARE YOU READY TO LEARN MORE ABOUT BOARDBOOKIT DISCUSSIONS? START A CONVERSATION TODAY!